Uganda, which assumed the presidency of the Africa Travel Association (ATA) a year ago after hosting the hugely successful 39th Annual Congress in Munyonyo, Kampala, yesterday evening hosted delegates and invited guests to a dinner at the InterContinental Hotel in Nairobi. The Honorable Doctor Maria Mutagamba, Uganda’s Minister for Tourism, Wildlife and Antiquities, welcomed the delegates of the congress and other invited guests to the dinner function, bringing back memories of the 39th Congress a year ago when she assumed the Presidency of ATA. With her was Mrs. Susan Muhwezi, the Uganda ATA Chapter President, both expressing their thanks for the honor of having been host country a year ago, after ATA held its initial function in 2004 when ATA’s Cultural Forum was held in Uganda. It is now the turn of 2015 host country Kenya to take over the rotating presidency of the Africa Travel Association for the next year, and Cabinet Secretary Phyllis Kandie, who was the guest of honor for the evening, readily accepted the challenge. Kenya traditionally hosts the round figure ATA congresses, and the next time the organization will return to Nairobi will be in 2025. The Kenya Tourism Board, aka Magical Kenya, played a key role in preparing for, organizing, and executing this year’s congress, and Managing Director Muriithi Ndegwa, seen in the photo with some of his key staff after a media briefing in the KTB Boardroom yesterday, repeatedly expressed his delight to host delegates from ATA member countries, in particular North America. He encouraged the media team and delegates to take back their own experience and impressions of the country and tell the world that the Kenya they saw is not the Kenya often portrayed in international news broadcasts. Meanwhile, it was learned that Rwanda will be host country for the 41st Annual Congress of the Africa Travel Association to be held in a year in Kigali, after joining the association as a full member. Rwanda was represented at the Nairobi Congress by the Chief Tourism Officer at the Rwanda Development Board, Ms. Belise Kariza, who took over office from Amb. Yamina who was shortly after hosting the Kwita Izina Gorilla Naming Festival posted as Rwanda’s High Commissioner to Britain. Being selected as host country reflects the strides Rwanda has made over the past decade in raising the country’s tourism profile. The sector is now Rwanda’s leading foreign exchange earner and visitor numbers have steadily risen over the years. The creation of a fourth national park two months ago, Gishwati-Mukura, underscores Rwanda’s ongoing commitment towards environmental protection and sustainability of a now greatly-diversified range of tourism products. The congress is now into its final day with the key topics dedicated to conservation. Kenya’s Dr. Paula Kahumbu of “Hands off our Elephants” fame is among the key speakers in the morning. eTN’s Publisher and President, Juergen T. Steinmetz, then makes another appearance as part of the afternoon panel when key media representatives discuss how best to tell Kenya’s story around the world. Tomorrow, delegates will enjoy host country day, traveling to a destination of their choice - either Lake Nakuru National Park or the Ol Pejeta Conservancy near Nanyuki - before heading out into the country for a safari proper prior to their return home. President Museveni's honored presence at the official opening of the Africa Travel Association's 8th Cultural and Ecotourism Symposium in Uganda sets the stage for many rewarding experiences and achievements to come. The Uganda President's biography in our magazine's center section illustrates his dedication, untiring effort and wise stewardship. Uganda is on the move! As ATA members, we are proud to be here in Kampala on the eve of our 30th Jubilee, to welcome Uganda as partners in this diverse and growing organization. ATA delegates, from the USA, Canada and 15 African countries, include tourism ministers and government officials, travel agents, tour operators, hoteliers, airline executives and media. According to the Uganda Tourist Board, the country attracts a special type of visitor; one who recognizes the value of an authentic African experience. The following excerpt from the UTB web site puts it into perspective. "Uganda has a rich tourism history, indeed we were one of the very first popular destinations on the entire continent of Africa. In 1907 we were visited by no less than Winston Churchill. His discriminating and perceptive analysis of what Uganda has to offer was recorded in My African Journey, where he wrote 'Uganda is truly the Pearl of Africa.' Uganda has lost none of its beauty, its magic, or its people's well-earned reputation for hospitality, modesty and friendliness. With the trials of independence and civil war now long past, Uganda has once again opened its doors to tourists. Over the past three years there has been much work done here by The Ministry of Tourism, through its associated agencies the Uganda Tourist Board and the Uganda Wildlife Authority, to sow the seeds of a brand new conservation-based form of sustainable tourism." This issue of Africa Travel Magazine is a what we call a DOUBLE WHAMMY - the second part appears early in 2005, with much more news, views, maps and photos. The follow-up on Uganda will be a commentary on what ATA members, partners, media and guests saw, experienced and learned during their stay in Uganda. Africa Travel Magazine's readers will view a gallery of photos from the event and on the exciting post event tours. This will be powerful ammuntion for ATA's travel professionals as they prepare for a record year of marketing Africa travel and tourism in North America. Africa Travel Magazine salutes Uganda and welcomes her into the family of nations represented by the Africa Travel Association. For an up-close, inside look at ATA activities, visit our web site and read "Hands across the Ocean," which outlines our progress since day one in the mid 70s. Our 30th Jubilee will Showcase Africa to the World! Why shouldn't we be upbeat! This venue in Uganda signals a landmark in the history of travel, trade and tourism, linking the great continents of Africa and North America. Like the lyrics from a popular song, "Getting to know you - getting to know all about you," travel agents, government officials and enterprising business executives from both sides of the ocean are brought closer together through the untiring, hands-on efforts of the Africa Travel Association. This Symposium in Uganda is a pre-launch of our Jubilee, as ATA marks 30 years since the association was founded by a group of travel agents led by Murray Vidockler, CTC, (dec.). 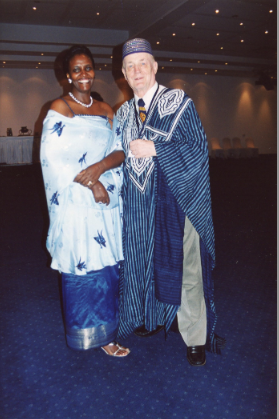 The first ATA Congress was held in Nairobi, Kenya and we return May 15-20, 2005. Flying here, from across the USA and Canada, mostof our travel agent members have made it their life's mission to get to know Africa. Some explore their ancestral "roots," making numerous visits to all corners of the continent, followed by organized tours in partnership with local agents and suppliers. Those partnerships are the real benefit to Uganda's participation in ATA. Encouragement and much assistance has been provided by government agencies such as the Uganda Tourist Board. A new ATA chapter in Uganda's success story, led by Mrs. Suzan Muhwezi, will be of key importance in opening the doors to tourism from North America. We salute all of the new ATA members from this wonderful country; one that is rich in attractions and famous for the hospitality of its people. A powerful, colorful, media-active "Africa Travel Jubilee Showcase" will take place from coast to coast in the USA and Canada, starting in January, 2005 with"Adventures in Travel Expos" in Chicago, New York and Washington, DC, followed by similar events in other major markets . Here's where Uganda and other ATA member countries can take center stage and benefit from the action. Last year's Expo in downtown Manhattan, was held during the coldest weekend in 50 years. Radio stations and other news media advised people not to go outdoors in fear of frostbite. What happened? Did you know over 22,000 visitors turned out, in spite of the freezing weather? What's more, Africa was extremely well represented. Copies of Africa Travel Magazines were available free at our exhibit, which anchored the Africa section. Visit www.africa-ata.org for a preview of Jubilee Year activities, with face to face encounters with North American travel agents and consumers on their own turf. For discounts on a display booth in USA, e-mail africa@dowco.com or ph. 604 681 0718. A biography in the center section of this issue is your introduction to Mrs. Suzan Muhwezi. It tells of her role in the tourism industry and outstanding efforts in launching this important, timely event and Uganda's first ATA Chapter. Our next issue will expand on her many achievements. Congratulations to Mrs. Muhwezi and her team. The Editor. Quick now! How well does the Africa Travel Magazine's web site score in the exciting, ever-changing world of fashion? The answers are astounding! In a recent search using the words Africa Fashion, our web site ranked#1 out of 2,800,000 entries on Yahoo, and was #1 on Google from 1,650,000 entries. Since Africa Travel Magazine's debut in 1995, African fashion has been a feature item on the editorial menu. It started at an event in Benin, West Africa, with our editor's keen observation and rapt attention to the wide range of colorful wear of our African and African American delegates were wearing. The wind up galas, held twice each year, were a kaleidoscope of color. What a splash! In this issue , we feature something very dear to my heart, so let's start at the top ... "le Chapeau Africain." Since hats, bonnets, turbans, wraps and unique coiffure are such a key part of Africa's fashion scene, I am pleased to present my first articles on this delightful, universal topic featuring the designs of Alphadi, Esterella, Chrystalix, Abdela , Oumou Sy, Gigi and others we have profiled on our ATA web site. An expanded version will follow in Africa Travel Magazine's 30th Jubilee editions, lighting the spark for a Jubilee Fashion Spectacular at Travel Shows in Africa, the USA and Canada. Africa Travel Magazine's next issue in early 2005 is an update of this current version. It will contain exciting photos of Uganda, from our cross country post tours and the ATA Symposium activities in Kampala. Photo Credits include: Uganda Tourist Board, Uganda Wildlife Authority, Robert Eilets, Official ATA Photographer, Africa Travel Magazine and Africa Travel Association Archives, ATA members and partners past and present.